Fortunately, almost gone are the days when an office was a place, where one was supposed to come to in a suit and tie and everything from the floor to the ceiling was monochrome gray. Today’s employers have finally understood the importance of setting creative mood and homey atmosphere in places, where people spend most of their lives. And today we’ll show you an office interior that is extremely inviting and welcoming – it’s energizing, very positive and encouraging for fruitful work. 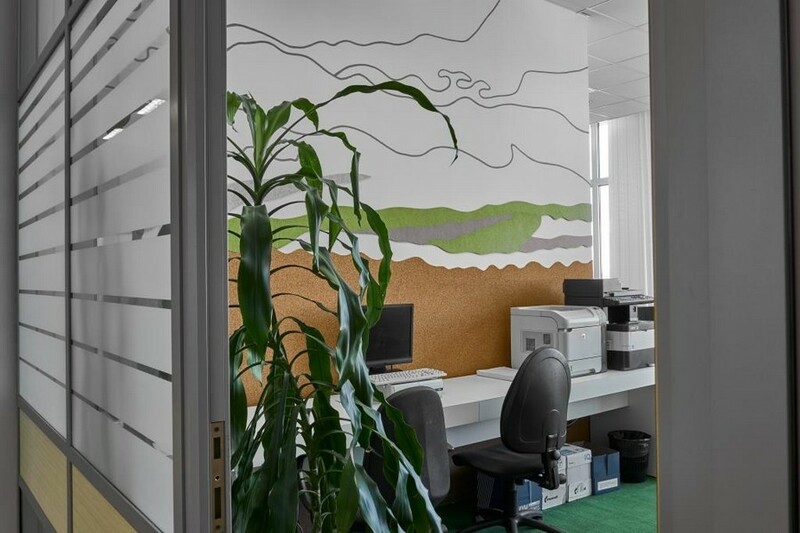 This office was created for the DESAN Company, which specializes on the production of canned vegetables, cereals and porridges. It was previously occupied by a different renter, but the client was pretty satisfied with its initial scheme and the layout remained unchanged, including the old glass partitions and ceilings. Most of the furniture was also transported from the previous office. So, the architects had to just work out an interior concept and fit it into the already existing framework, focusing mostly on floor and wall décor and design of public spaces. For a start the general concept had to be selected – it was supposed to encourage esprit de corps and clearly express the company’s sphere of engagement to visitors. Given that the company is closely related to agriculture, chosen as the key concept of the interior was the theme of fields. But not just common fields, but the most inspiring ones, like on Van Gogh’s pictures – in different shades of green, yellow and orange. 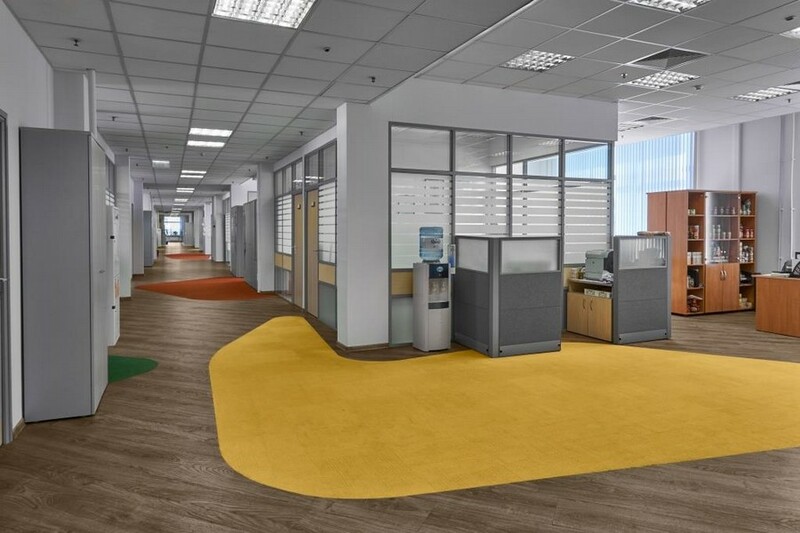 Thus, the floor was divided into bright asymmetrical fields, which mark certain functional zones of the office, but are not tied to the geometry of the partitions. 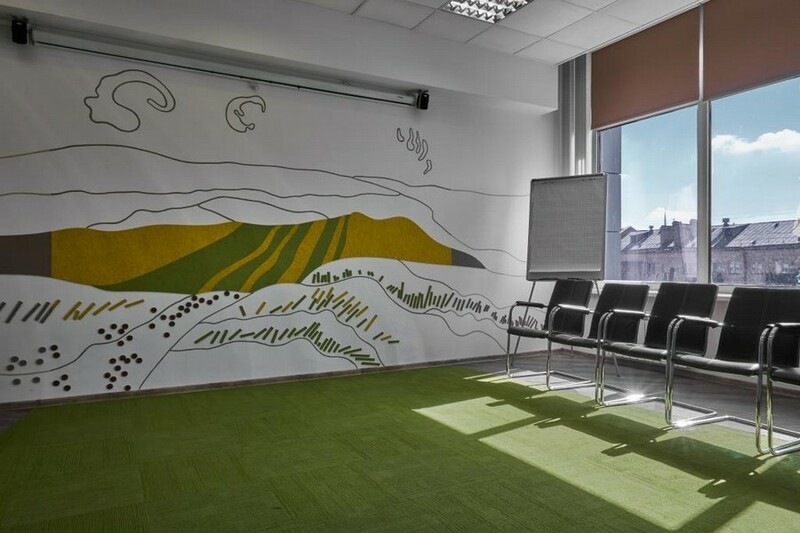 And the walls were decorated with makeshift replicas of Van Gogh’s meadows, which were created with the help of multicolor felt wall coverings by Buzzi Space. In printing areas they were complemented with cork boards for making notes. 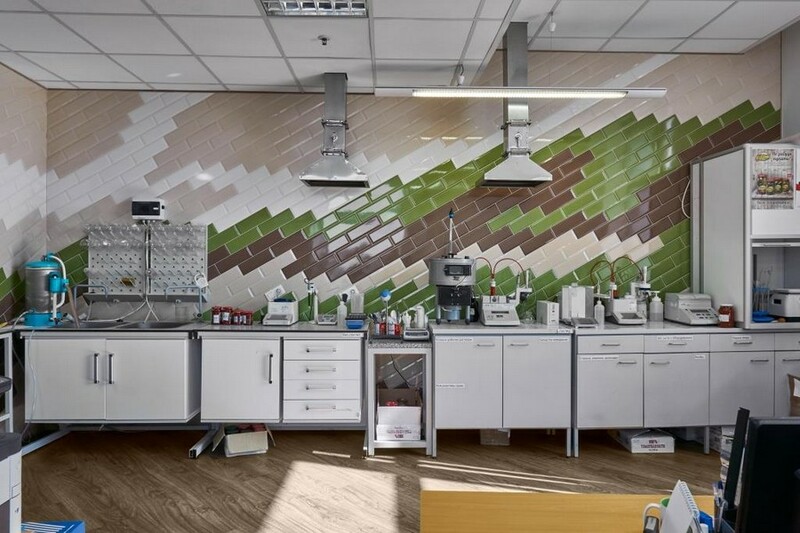 Besides, the office was equipped with two important public areas: a coffee zone and laboratory for testing the company’s products. The presence of Van Gogh is also felt there: the walls are faced with tiles in a pattern reminding of the painter’s artworks and perfectly blending with the general interior concept. 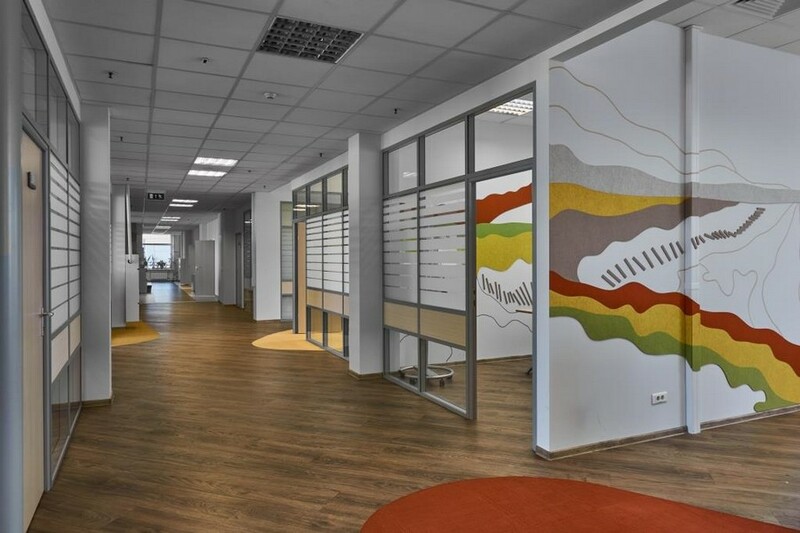 The old furniture of the client also found a worthy place in the new environment: orange color of desk dividers and reddish hue of furniture lamination perfectly matched the bright colors of Van Gogh’s “fields”. In the big meeting room shelves displaying the company’s products were custom-made in the same hues that were used for the office décor. 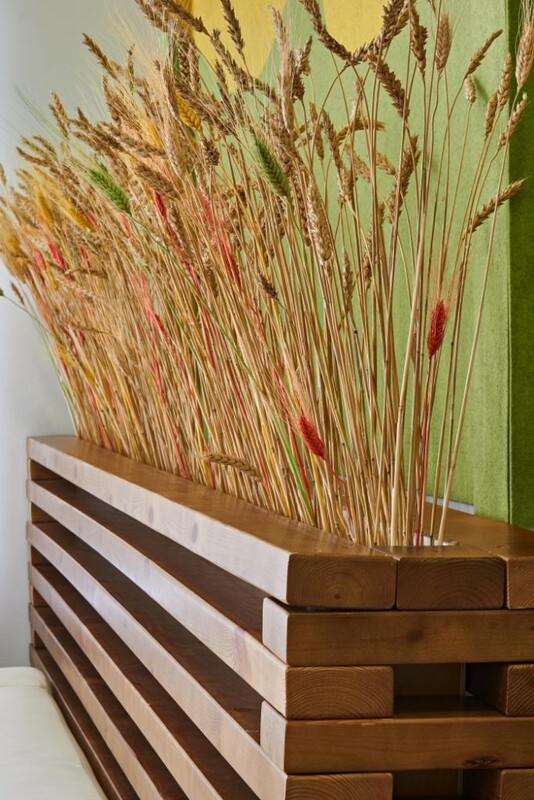 As for the green part of the interior, the authors of the project decided to abandon traditional potted flowers with wooden plant holders filled with golden wheats – the symbol of soil fertility and the main component of cereals and porridges produced by the owner of the office.